Many of you are aware of the crisis that occurred two weeks ago at the National LGBTQ Task Force's (Task Force) annual Creating Change conference, which I and many others have covered at this site and elsewhere. Today I'd like to examine in greater detail the club used by the radical left to slander and libel their Jewish compatriots. I call that weapon "pinklying"; they call it "pinkwashing." The term "pinkwashing" has been around for awhile, but has gotten new life thanks to this manufactured crisis at Creating Change. Kudos to the disruptors for getting the word out -- Creating Change is now the go-to destination for the young activists who demand attention and create drama rather than change -- but now they will have to defend it against an engaged and better-educated opposition. "pinkwashing": a deliberate strategy to conceal the continuing violations of Palestinians' human rights behind an image of modernity signified by Israeli gay life. So let's do a bit of exegesis on this definition. I think it's fair to say that most leftist Jews have a real problem with "the continuing violations of Palestinians' human rights." I work for a two-state solution because I'm appalled not only at those human rights violations, but the violation of the core integrity of the Jewish soldiers asked to carry them out. That my children's generation feels obligated to carry out those orders causes me despair. I am very grateful to Breaking the Silence for speaking out on this very issue. Israel does have "an image of modernity" because it is a modern state. Denying that is absurd. Is that modernity "signified by Israeli gay life"? To a degree, and that "gay life" sets it apart from the Arab world in general. One should know, however, that while the law in Israel is quite supportive of LGBT citizens, only 40% approve of homosexuality (though compared to only 4% in Palestine). The rabbinate, which controls all family law in the state, is vociferously opposed, and the most extreme fundamentalist Jews are inciting murderous violence against the queer population. A Wider Bridge (AWB) exists to build relationships with organizations like the Agudah and Jerusalem Open House to help them confront the daily threats to their existence, threats that exist even in the "modern" state of Israel. The crux of the problem is in the beginning phrase: "a deliberate strategy to conceal." There may be instances when this has occurred, and I vaguely remember an Israeli government official reported to have done that once. If this were to occur, we would oppose it, so there would be no conflict and no need to shout "#cancel pinkwashing." 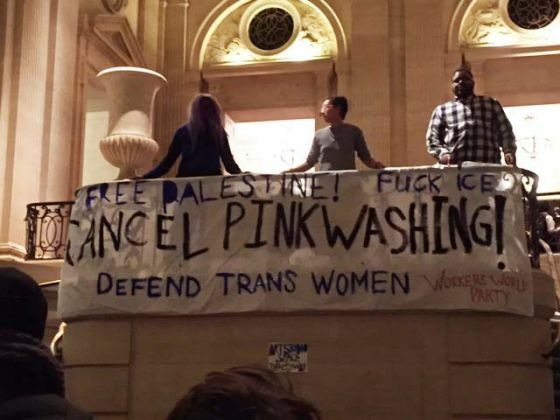 Some young queer Jews, as well as those persons of color suckered into totally one-sided solidarity with Palestinians who are no more "of color" than the majority minority population of Israel proper, are converted by the trope of pinkwashing. Yet while it's been in use for over five years now, it's gained very little traction in the LGBT community. The current crisis, media-driven because of the doubly inept handling of the issue by the Task Force, is derived from the BDS (Boycott, Divestment, Sanction) crowd's use of "pinkwashing" as a euphemism for "Israel." Attacking A Wider Bridge (AWB) when it does not have such a deliberate strategy, and its board is opposed to the occupation and supports a two-state solution, is a cover for a more fundamental onslaught against the Jewish state. I could only find one blogger, Ben Murane, on the jewschool.com site, who actually looked into AWB's history to determine if it was in cahoots with the Israeli right wing. One protestor, writing in the Washington Blade, blithely writes that the reception was "cancelled over the organization's cooperation with the Israeli government whose policies violate the human rights of Palestinians living under occupation." But AWB doesn't cooperate with the Israeli government in promoting the occupation, unless all contact with Israel, beginning with passing through Passport Control, is deemed "cooperation." "Free Palestine from the river to the sea" much more accurately reflects the mission of the pinklying crowd, which knows they would have much less traction at Creating Change if they simply ran a BDS panel and couldn't tie their political strategy directly into the queer community. The Schulmanites tried this back at the 2011 Creating Change, if I remember correctly. The Blade writer mentioned above readily admits that "a superficial reading (of the chant) would invariably cause anyone who hears it to believe it means the destruction of Israel." So they routinely smear and slander instead by callously spreading the libel of "pinkwashing," and in so doing have alienated many current allies. Not exactly the kind of coalition building for which the Task Force used to be known. I don't like accusing people of anti-Semitism, particularly other Jews. I've been attacked as an anti-Semite by friends on the right over my support for the P5+1 agreement with Iran last year, which has already ended the Iranian nuclear program. My distaste is compounded by the Netanyahu administration's recurrent use of the charge whenever anyone or any organization criticizes Israel, as if it can do no wrong and each criticism rises to the level of existential threat. This barrage from the right now provides cover to those on the left who dream of Israel's destruction, whether it's the dissolution of the state or its military defeat. Since any criticism of Israel is viewed as anti-Semitism by the Israeli government, the charge has been drained of much of its potency. When a person conflates Jews, Israelis, and the Israeli government, it is anti-Semitic. When all Jews and all Israelis are held responsible for the actions of the Israeli government, it is anti-Semitic. When Jews would be denied the right to self-determination accorded to all other peoples, it is anti-Semitic. The pinklying crowd, as evident in their assault at Creating Change, conflates queer Jews with Israelis and the Israeli government. A Wider Bridge and its members and guests were all mindlessly held responsible for the actions of the Israeli government. None of the protestors, nor the Task Force, ever bothered to ask the organization for its positions on the issues of concern. And the chant, "Free Palestine from the river to the sea," seeks to deny Israeli Jews, and only Jews, of the right to self-determination. This is not social justice. Jews have the right to be engaged about Israel, as do Palestinians. American queer people of color have the right to be concerned, too, but they have no right to elevate this single global issue to a litmus test for membership in the progressive LGBT movement. When they do so, and align attacking Israel with the need to support trans women (thank you, American communist party), as the protestors did in Chicago, they are acting out just as the bigots of the right do against them. The President just proudly stated, "We are all Jews." These actions by the radical queer left, allowed to proceed by the leadership of the Task Force, have become a wedge that threatens the cohesion of the queer community. Instead they should be meditating on the President's words. My declaration to the radicals: You have real enemies out there. We are not among them.